This season, you may have decided to buy a professional camera; it may be because you are tired of your ‘selfie’ camera or just because you are an armchair traveler who has been reading blogs on various websites and following travel photographers from all across the globe, and you too want to try your hand at photography. You are probably wondering where to start; whom to ask. Don’t worry, we are right here to help you make the right choice and ensure the best buy. In this guide, we will not only review some of the best cameras for beginners but also discuss in detail the important factors that you need to consider before finally purchasing one. 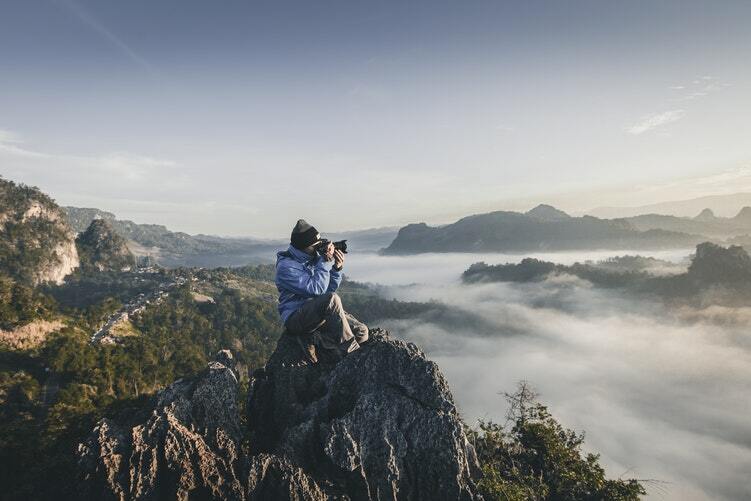 The industry for photographic gear provides a plethora of options, and there are a lot of technicalities that professionals keep in mind while making their choices, like shutter speed, megapixels, etc. If you are a beginner, then it might be little tough to understand these terms and make a decision based on them. SHOW ME THE TOP 10 CAMERAS FOR BEGINNERS NOW! Entry-level cameras and DSLRs for beginners offer a step up in image quality from a cell phone’s camera without demanding too much of technical knowledge. Best starter cameras demand greater manual control, and you will be required to change lenses according to different photography projects. If you have already started worrying, then do not, because nowadays, there are many auto modes available to aid you till you get comfortable with other controls of the best professional cameras for beginners. The basic principle that you need to understand before buying a best beginner camera is that the more you are willing to pay, the more features you will receive. However, it is important to question whether you need such high-tech features or not. If you really want to get into photography in the near future, and not only use the camera for recreational purposes, then you can surely go for multi-featured professional cameras. Although, we would still recommend that you choose according to what your pocket allows. To make your task easy, we have combined a list of top 10 best cameras for beginners, which provide some of the best features, and at the same time, do not leave a hole in your pocket. Before we move on to reviewing these products, it is wise to look at some of the considerations you should definitely keep in mind before buying the best camera for beginners. Buying a new camera can be a challenging task, especially if it is your first time, because there are plenty of models available in the market, which can often get confusing. However, if you keep in mind all the factors we have listed in this guide, you will be able to make the best decision. Usage is the most important aspect which needs to be addressed before you buy the best camera for beginner photography. This is the first step,and it will further help determine your priorities. You also need to know the different ways in which you can use a camera, except, of course, for clicking basic pictures. For example, you may use it for recording important family events and parties, like your child’s birthday party, an anniversary celebration or a small formal gathering at home. You can even record events that happen outside your home, like a great soccer match, your child’s ballet performance, or a fun night at the bar with your friends. You can use your camera for clicking pictures of landscapes. Additionally, you can join photography clubs, as well as, get enrolled in a photography course for beginners. If you are the kind of person who loves to travel a lot, then you can perhaps click for travel magazines: shoot landscapes and beautiful streets. All of these are great reasons for buying a camera, and they may affect your priorities while choosing too. If you want to use your camera to record events with family and friends, you might require a camera which is portable and compact. If you want to contribute to travel magazines and engage in professional shoots, then you can go for something more resilient, for example, cameras that don’t get damaged from getting splashed with water. If you want to try artistic photography, then go for one of the best amateur cameras with high picture quality. No matter whatever you choose, keep your purpose in mind. Each and every person demands different features when it comes to a best camera for beginners. Ask yourselves, how much are you willing to pay. There are a wide range of options available online, as well as, in stores, ranging from lower-end to high-end models. The more high- tech features you want, the more you have got to pay. For example, high-end expensive models may be splash-proof, freeze-proof, shockproof, dust and sand resistant, may have built in Wi-Fi or GPS, fast shutter speed for ultimate action shots, touch screen LCD viewfinder, etc. If you browse through some of the most popular websites which sell best cameras for beginners, you will find cameras ranging from $50 to $1000. We suggest that you visit some of the best websites, or visit nearby electronics stores; check manuals of the models you think may serve your purpose, and then finally set a budget. You should know how much you are willing to pay. You may have to compromise on certain things if your budget doesn’t allow you to spend much. We are not saying that you can’t get a good camera at a low price, but knowing your price range can make your task much easier. When you decide to move from a cell phone camera to a professional camera, you tend to consider the megapixels a camera offers. The general notion is that the more the number of megapixels, the better the image quality. We are not saying that this is not true, but it is, for sure, much more complicated than that. You need to know how a digital camera functions in the graphic world. Light travels through the lens and via the sensor where it is further recorded. The number of megapixels indicates how many sensor elements there are. For example, if you have a 16mp camera, then there are 16 million pixels in all that will be recorded. Now comes the complicated part, if you have too many megapixels on a small sensor, your camera may be trying to stuff a lot of information into very little space. This can result in image noise and lower level of clarity. So what is more important than megapixels is sensor size, and that is what you have to keep in mind while buying the best camera for beginners 2018. The function of the image sensor is to collect the light from the object you are shooting. It can be understood as the “film” of the camera. Before digital SLRs were introduced, cameras used to employ 35 mm films; therefore, films that used to capture light were 35 mm wide. Now, the best quality DSLRs are referred to as full-frame, and their sensors are 35 mm wide. There are two kinds of sensor sizes available in hybrids; the Micro Four Thirds and the APS-C. The Micro Four Thirds, as the name suggests, is smaller and is more for portable. The disadvantage here is that it cannot provide the best picture quality. The other option – the larger APS-C sensor adds more bulk, but it also provides better image quality, and facilitates low-light shooting. These sensors are in the range of 20 mm to 28 mm, which is pretty good for beginners. The best camera for amateur photographers is one with Micro Four Thirds sensors because of its size and cost. However, if you prefer spending more money on a camera which is more professional, you should go for the other one. In this process, do not forget to consider the amount of pixels the sensor can capture. Hybrids usually offer 14 MP to 24 MP. If you need to get a standard sized photo printed, any amount will work. If you want to print large portraits and posters, or engage in detailed photo editing, more megapixels will be better. To sum it all up, the better the sensor of your camera, the better the image quality will be. It all comes down to how much you are willing to pay. How Much Zoom Will You Require? The amount of zoom that a best camera for beginners advertises is another major concern. In the previous decades, 3X zoom used to be a great amount. Today’s cameras offer 10X, 20X, and even greater levels of zoom. The higher the zoom, the greater will be the versatility of the camera as you will be able to capture objects at a greater distance. DSLRs do not list any zoom level, because in a DSLR you can change the lenses and get the desired zoom level. The standard size of a DSLR lens is 18-55 mm. You also have the choice of adding telephoto lenses with lengths ranging from 200mm to 300mm (and beyond). A camera with interchangeable lenses will serve you well if you need the ability to zoom in on a subject. If you decide to choose a point-and-shoot camera, do ensure that the zoom measurement you utilize is optimal zoom. This is radically different from digital zoom, which enlarges the pixels on your picture and leads to a low quality picture. We suggest that you buy a camera which offers 10X optimal zoom because that will be suitable for every kind of use, and deliver better performance. Hybrids come with interchangeable lenses. You can get a variety of lenses for different kinds of shots, like lose, wide-angle, distance etc. Do ensure that you know what type of lenses are compatible with your camera model. Micro Four Thirds cameras offer sundry options. You will be able to find lenses ranging from high-end Leica DG to cheap Holga lenses which are compatible with these cameras. Professional photographers know how to operate manual camera settings. However, as a beginner, you may find it difficult to operate them with the same efficiency. Through settings, you can alter the camera’s exposure, depth of field, shutter speed, etc. The best camera for beginner photographers is the one which lets you control the settings easily. For example, some of the best cameras for beginners let you skim through settings using the lens’ manual focus ring. You can check the manual of specific camera models to gather more information about the manual settings as a few changes made manually can lead to brilliantly clicked pictures. If you are a person who is looking for the best camera for beginner photography – a device to take on family events or friendly tours – you probably don’t want to spend too much. Instead, you will require a compact and portable model with good picture quality so you do not need to worry about upgrading in the future. We recommend that you spend a little more money to buy a new camera now, and after 5 or 6 years you can replace your old one with a latest model if you want. On the other hand, if you want to buy a professional camera to pursue your passion, or want to establish a name as a photographer, you will definitely have to keep upgradeability in mind. Many professional photographers begin with a single lens and a few accessories like a camera bag and a tripod. These people need to upgrade their cameras without having to purchase a new one after every season. For example, a DSLR can be upgraded by buying new lenses, exterior flashes, neutral density filters, changeable straps and many other kinds of improvements. A DSLR or a bridge camera can be more expensive than other cameras for amateurs, but they are worth spending on if you will require regular upgrades. So make sure that you make a list of all the features you desire in your new camera. Think through each factor mentioned in this list, then look for those models which offer what you want, select the best one and then purchase it. This section of our guide deals with some of the best beginners’ cameras available online. You may have a look at some of the most popular cameras on our list and make an informed choice. You can also look up for similar models. It may not be one of the most expensive DSLRs, but it provides some of the best features. First of all, it is easy to use, just like a point-and-shoot camera. It is easy to use because of its compact and comfortable design. So if you are a person who likes to record special events or carry it for local travel escapades, then this is a great choice. It has APS-C CMOS image sensor, which is 15X larger than those used in cell phones, and thus, provides sharper and clearer photos. You can make 1080 full HD videos by using this camera with monaural sound at the touch of a button. It comes with 24.4 megapixels, Nikon DX lens mount, and a continuous shooting speed of 5 fps. The brand itself has labeled the user level of this design as beginner. It provides excellent image quality and is quite easy to handle. This is what makes this model one of the best cameras for beginners. It offers a comfortable handgrip and advanced control layout at the rear. It is also equipped with Nikon’s clever guide mode; it helps to explain to beginners how some of the key shooting features work. You can share your clicked photos with a smartphone or a tab using Nikon’s snapbridge application. This one is a little less advanced than the previously mentioned model as Nikon D3500 took over the top place. However, it does share several features with the other model. Nikon D3400 also provides SnapBridge Bluetooth connectivity to share pictures with a phone or a tab. 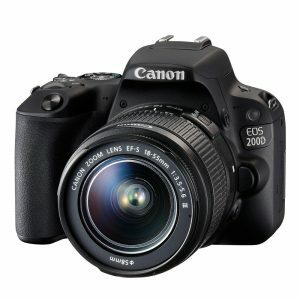 It offers 24.2 megapixels and DX-Format CMOS sensor. It has EXPEED 4 image processor, as well as, no optical Low-Pass filter. It offers 5 fps shooting speed, Nikon DX lens mount and a maximum video resolution of 1080p, all similar to the other model. This one is also an ideal model for beginners as it sports a variety of features that are perfect for a novice photographer. It offers great battery life and splendid image quality. 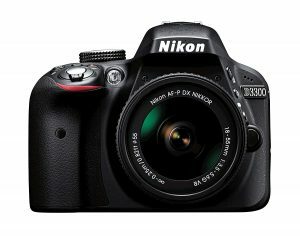 So, if you are not able to buy the Nikon D3500 model due to monetary constraints, you can always opt for this one because you can get similar features at a lower price. This, for sure, is one of the best cameras for new photographers. Canon has always been one of the most loved and evergreen brands, and it provides a range of the best cameras for beginner photographers. Canon EOS REBEL may be one of the best options in the market, but it can be little too pricey for some. It offers high speed continuous shooting at the rate of up to 6 fps, and is equipped with RGB primary color filter system. It offers 24.2 megapixels, Canon EF-S lens mount, APS-C CMOS sensors, max video resolution of 1080p and a 3 inch articulating touch-screen (1,040,000 dots). It comes with a plastic finish and delivers an advanced high ISO performance as compared to other older models by the same brand. It also offers autofocus, which gives this model a boost with a 45 point arrangement which is backed up by a splendid live view AF system. The only shortcoming of this model is that it doesn’t have 4k video features, and the quality of the exterior material is not that great. Nevertheless, its recently designed graphical interface makes this model quite appealing to novice users. This is yet another model by Nikon which has made it to our list of top 10 best cameras for beginners. 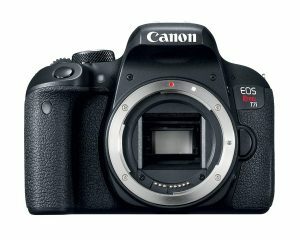 It gives tough competition to Canon’s EOS Rebel T7i/ EOS 800D. It has 24.4 megapixels and CMOS sensor. It also offers continuous video recording at 6 fps, as well as, SnapBridge Bluetooth connectivity to share pictures via a smartphone or a tablet. Glance-autofocus is available with AF-S, AF-P, and AF-1 lenses. The D5000 series by Nikon is a little expensive but offers ideal cameras for greater creativity. This particular model flaunts a large 3.2 inch vari-angle touchscreen, plus, the live view focusing speed is also great. The logical control layout of this model makes it easy foramateur photographers to deal with. This is another Nikon entry-level DSLR with built in GPS system, slow live view focusing and high res, non-anti aliased sensor. 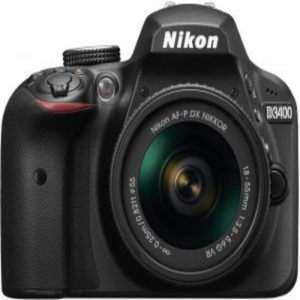 It boasts of 24.2 megapixels, Nikon DX lens mount, max video resolution of 1080p, and APS-C CMOS sensor. The D5300 model by Nikon was launched a little before the D5500 (which took its place), but the D5600 model is the most advanced in the D5000 series. This specific model boasts of the same megapixels and ISO 25,600 sensitivity as the D5500 model. This model doesn’t offer a fancy touch screen control, instead it has a GPS. 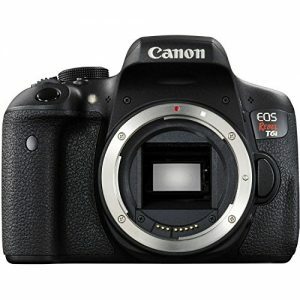 It offers a battery life which is better than its Canon counterpart, i.e, Canon EOS Rebel t6i/ EOS 750D. To sum up, it is not the latest entry-level DSLR for sure, but it is still a smart buy because of its price. Sony is another renowned brand which is famous for its wide range of electronic devices like TVs, DVD players, washing machines, refrigerators, etc. When it comes to cameras, Sony provides a many options that cover a wide price range. 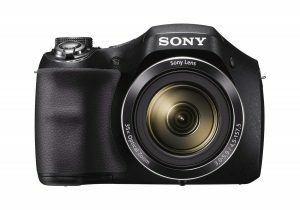 The Sony DSCH300/ B Digital camera is the best camera for amateur photographers due to its powerful 35X optimal zoom and 201 MP Super HAD CCD sensor, which create brilliantly detailed images. It offers minimized blur level with optical steadyshot image stabilization, and is therefore, suitable for those who want a camera to click professional photos for magazines, portraits, publishing, or other endeavors. If you are a budding photographer who is looking for something more professional without compromising on the ease of operation, this is the ideal buy for you. You can even upgrade this model from time to time, by changing its lenses and adding other photography gear. This model is a great amalgamation of top-notch ergonomics and a splendid sensor. It does share some features with EOS Rebel T7i/ 800D, but it is a little less advanced than the latter. You can always choose this one if the price of the latest model in the series puts you off. This model includes a lens with warranty and the manufacturer’s original accessories kit. It offers a 58 mm 2X professional telephoto lens, a high definition 58 mm wide angle lens and a digital DSLR auto power slave flash. It also comes with a water resistant camcorder and SLR camera case, replacement RC-6 remote control with a 3 piece filter kit. Additional gear include a UV protection filter and a 2X SanDisk ultra 16GB memory card. The sensor is not as good as the latest model by Canon, but it is still very good. The vari-angle touch screen it sports is one of the best out there. The only con is that the AF performance still needs much improvement. 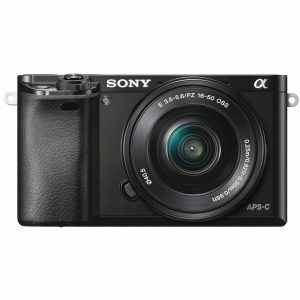 This is another one of the best cameras for beginners by Sony which features high resolution with a 24 MP APS-C sensor and one of the fastest auto focus with 179 AF points and 11 FPS. You can easily record full HD 1080/24/60 p videos on it. You can also click low-light pictures due to its ISO range of 100 to 25600. You can share all the photos clicked on this camera with your tablet, or smart phone with Wi-Fi and NFC feature. It comes with a warranty period by the manufacturer. Extra accessories include a UV protection lens filter, a 3 piece lens filter kit, a SanDisk ultra 128 GVB SD card, a Wasabi Power Battery 2 pack and dual charger, a camera bag bundle, and a 12 inch Spider tripod. It is one of the best beginners’ cameras because of its low price and a variety of features. If offers APS-C CMOS sensor and 24.2 megapixels. The lens mount is Canon EF-S with a 3 inch vari-angle touch screen. It provides a continuous shooting speed of 5 fps and max video resolution of 1080p. It is very compact, and hence, easy to carry, with a battery life which is rated at 380 shots. When it was launched in 2013, it was declared the smallest DSLR available in the market. This is the last one on our list of top 10 best cameras for beginners. 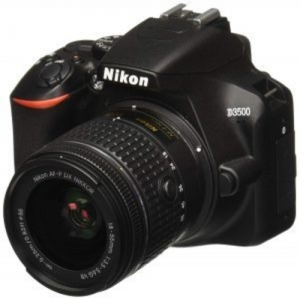 D3300 by Nikon provides 5 frames per second continuous shooting, as well as, 11 AF points with 3D tracking. It offers ISO 100-12800 which can be extended to 25600. It comes with 24.2 megapixels, CMOS DX format sensor and 3X optical zoom. It is available at a great price on Amazon, and is one of the best cameras for beginner photographers who want to hone their skills. These are the 10 models which have made it to our well-curated list. If you find any of these cameras appealing, you can learn more about their features by reading their manuals from the manufacturers’ websites. If not, then you can explore other brands and models online on Amazon, and finally select a camera which suits your demands and price range. In this guide, we have highlighted some of the factors you need to keep in mind before purchasing a camera, and presented detailed product reviews of some of the best starter cameras. However, there is another important thing that you need to keep in mind – the type of camera you want. Compact digital cameras are easily the most popular ones, which are widely used by people because they are simple to use. Their functioning is not at all complex, and is hence used for routine purposes. They are also referred to as ‘point and shoot cameras’. They are very compact and easy to carry. The portability of these cameras allows one to use them to record any event, like a sporting event, your child’s first play, a birthday party, etc. They are cheaper than the other types of cameras, and so they boast of fewer features than the others. The picture quality provided by these cameras is also not the best. They can be further categorized into 2 types: ultra compact cameras, these are smaller and compact cameras, which are slightly larger. They are not only simple to use but offer other features as well, like you can store images on your computer or your laptop as JPEG files, and you can see live previews before clicking pictures. Additional features include low power flashes that help you take pictures in the dark or low light areas, and an auto-focus system with closer focusing ability. These features may sound similar to those that are seen in other cameras, but do not forget that the magnitude of the features may be lesser. For example, flash can be used only for objects that lie nearby and the preview of the photo to be clicked may offer less motion capability. The image sensors employed in these cameras employ very small diagonal space (nearly 6 mm with crop factor of 6). This is the best camera for a beginner because it is easy to use, but if you are looking for something more professional, then you should take a look at the other categories. Generally, bridge cameras are often mistaken for single lens reflex cameras (SLR), but that is not the case. The two do share some similar properties, but their features also differ to some extent. For instance, bridge cameras offer fixed lenses, small image sensors, and live preview of the photo to be clicked. Extra features include auto-focus employing contrast detect method, as well as, manual focus, image stabilization to reduce sensitivity to click better pictures. Images can be stored on your computer as compressed JPEG files. They may look similar to SLR cameras, but they function at a much slower pace. The SLR cameras are greater in size, and therefore, have high zooming capability and quick apertures. The manual or auto-focus can be controlled according to one’s necessities. The image preview is also different because it uses either an LCD or an Electronic viewfinder (EVF). You may have heard this term before in your life as these are one of the most top- notch cameras, which cost even more than the previously mentioned types. They employ the single lens reflex method similar to any other ordinary camera with a digital image sensor. The SLR method contains a mirror which further reflects the light passing through the lens with the assistance of an optical viewfinder. Other features of this camera are live preview mode, the placement of a distinct type of sensor in the mirror box for getting autofocus, and high tech sensors with crop factors from 2 to 1 with diagonal space, ranging from 18 mm to 36 mm. It also provides high picture quality even in low light areas. The lens of the camera is interchangeable, and the user can choose any lens needed for a particular shot. A focal plane shutter is employed in front of the image, and the depth of the field is very low at certain apertures. This type of camera is an amalgamation of very huge sensors and interchangeable lenses. The preview is constructed using an EVF. It does not employ any complicated mechanism like that in a DSLR. The shape of these cameras is also a little different when compared to other types. This is a unique film camera which comes with a rangefinder. With this kind of camera in hand, taking distant shots is very possible and easy. Though many other types of cameras can be used for the same purpose, those do not employ the rangefinder technique. This is the last type of camera mentioned in our guide, and it is basically used for containing high image resolutions at a very fast speed.Single pixel of image sensors is employed instead of a matrix system to make this mechanism run successfully. This kind of camera is usually used by professionals to capture pictures of continuously moving objects. The data which is produced by this camera is one dimensional. It needs to be transferred onto a computer or a laptop to make it two dimensional. The 2-D data which is obtained is further utilised to fulfill the needs of the photographer. We hope this guide has provided you with some important information regarding cameras for beginners. We have not only reviewed the best cameras for beginners but also listed crucial factors to keep in mind before making a final decision. By knowing the different types of cameras that are available in the market, you will easily be able to select the one which suits your needs the best. For more information on any of the products, refer to the manufacturers’ websites. Hopefully, you will be able to make the a decision much more easily because of this guide.